The game has officially been released! Check out the review here or download the game! 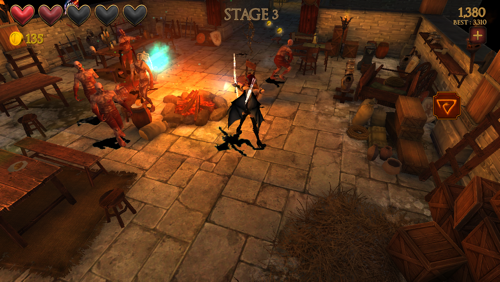 iOS gamers looking for a high quality 3D action game might not have much longer to wait. Although there are no shortage of dual-stick shooters and top down 2D brawlers available for the iPhone and iPad, real console-class action games are hard to find. That’s where Zombie Goddess enters the picture. 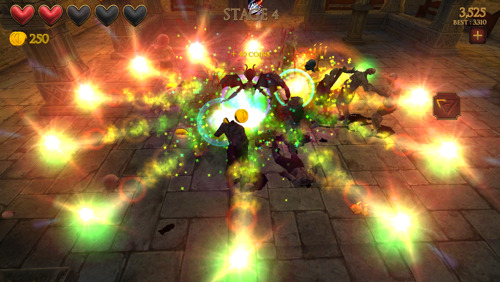 The goal of Zombie Goddess is to survive as long as possible against waves of the undead, killing as many as possible, and collecting as much gold as you can find. 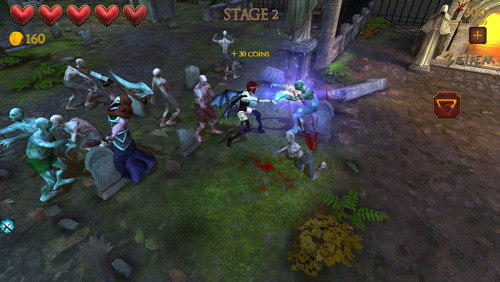 Completing various objectives – for example, decapitating 20 zombies in one game – increases the amount of gold dropped. This gold is used to unlock additional weapons and characters, leveling up the weapons you have, or unlocking perks for the next level. The real meat of the gameplay lies in chaining together attack combos. When you collect enough gold to unlock an additional weapon, that weapon will periodically spawn throughout the map. Collecting that weapon can significantly alter the feel of the game â the daggers are fast-striking weapons, allowing for rapid fire attacks; the bow is a ranged weapon controlled through the right analog stick, turning the game temporarily into a dual-stick shooter; the axe is a heavy, powerful weapon requiring careful timing to avoid taking damage while wielding it. All 5 of the unlockable weapons have one thing in common â they enable a “special” gauge. Each time you get a hit in on an enemy, you fill your special gauge a bit. Fill it all the way, and you can unleash a powerful special move. The nature of the special move differs depending on the weapon, but they’re all extremely powerful. However, using the special move removes the weapon, forcing you to collect another one and start the process over. It’s a simple mechanic, but it’s satisfying in practice. Zombie Goddess won’t disappoint in the graphics department, either. Fluid animations, detailed textures, and realtime shadows all occur at a solid 60 frames per second, making for a game that both looks and feels beautiful. It isn’t merely beautiful in the aggregate, though – little touches belie advanced technology behind the scenes. Enemies react differently depending on how you attack them â a powerful full-on attack can decapitate an enemy, while a more distant attack will merely injure them. Throwing an enemy up into the air allows you to selectively dismember them by slicing your finger across the screen – not just a cool effect, but a nice break from the intensity of the action. I was invited by the developers to help test the controller support in Zombie Goddess, and I’m happy to say that it plays quite well with the Moga Ace Power, SteelSeries Stratus, and Logitech PowerShell. Many of the tweaks I’ve suggested have already been implemented. With that said, the game is still not quite finished yet, and there are still a few things missing. I’ll get into a more detailed discussion about controller support when the final build is available, but suffice it to say, the game is still a lot of fun with a controller in its current form â far better than using touch controls, and reminiscent of the type of gameplay experience you could expect from playing a true console action game. Zombie Goddess is in the home stretch of development right now; if everything goes as planned, it should be hitting the App Store within the next few weeks. It will be available as an ad supported free trial download, with a one time in-app purchase to remove the ads and unlock the full game. There will be no timers or premium currencies.